Josie was eight years old today. It is hard to believe and then there is Kevin. Every time I think of Kevin's birthday I think of the time he was born. I was Radio Officer in S.S. GYPSUM KING with the late Captain Adrian Blinn. Where does the time go? The temperature at 7AM was 48.6F under mostly cloudy skies. 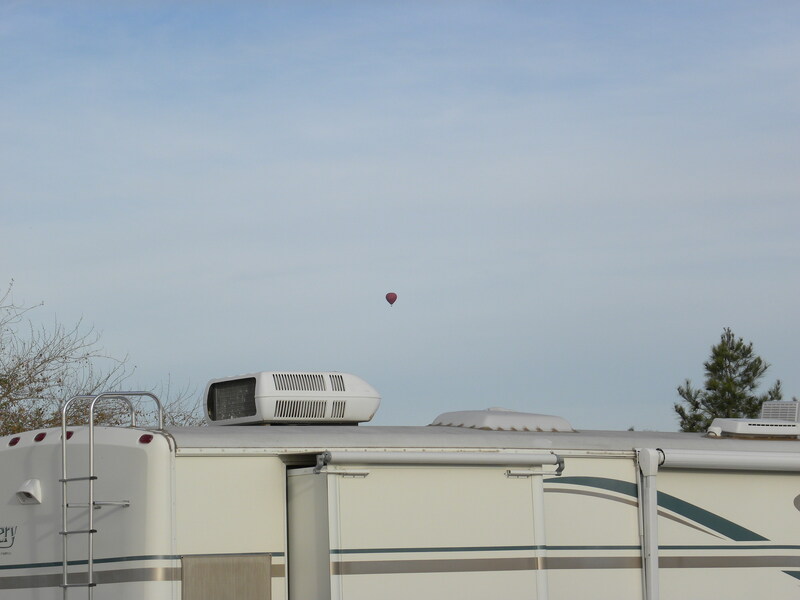 There was no bright sunshine shining in the trailer or around it when the sun came up. 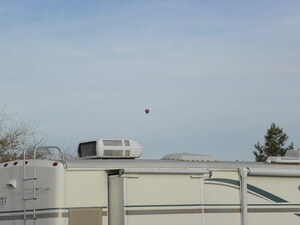 The first hot air balloon to come around was this morning while I was in the shower. Joan managed these photographs. Apparently its name is Spirit but I can see no registration on it. I believe they are registered like an aircraft. The temperature at 8:50AM was 61.0F still under mostly cloudy skies but the sun is shining. When Joan and I came home from church at 11:10AM the temperature was 71.8F and mostly cloudy. It was rather hazy but did not seem to affect the amount of sunshine that much. The music was certainly bang on again this morning. The choir director became quite excited it was so good. The preacher said several have mentioned to him that they wished they had that choir in their home church. A good many churches wish that I am sure. I know my mother would have enjoyed it. A church service was about the only thing she would attend towards the end. There are folks starting to leave for home. These lots are 50 feet by 30 feet and when empty they leave quite a gap in the line. At 1:30PM the temperature was 78.8F and mostly cloudy skies. It was quite hazy but lots of heat in the sun and a nice breeze to make it perfect for sitting out. Jan and Ron made it back from Yuma after a great trip and Joan and Karen went for a swim at 1:30PM. A lot happened at 1:30PM and it was quite exciting. At 2:20PM the temperature was 80.2F and still mostly cloudy causing the sun to come and go a bit as the clouds pass over. Joan was home at 3PM when the temperature was 79.6F, mostly cloudy and quite hazy. At 6PM it was 73.0F and overcast. The para sails were around again this evening. 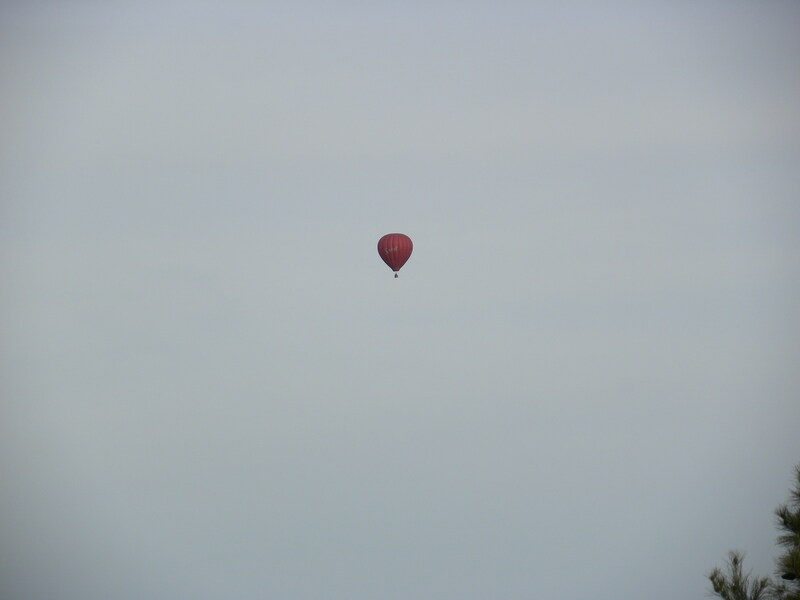 A couple of them went up quite high but where they went I have no idea. They did not land around here. 14023 kilohertz was on all day. We heard a few things but nothing to get excited about and we did not try and work anyone. When the movie ended the temperature was 62.8F under a clear sky. It is truly amazing how fast an overcast sky can become clear around here.